Thus, in order to recognise in the Gospel the Saviour of the world, these are the signs we should seek; the Man of Sorrows, rejected by those He has come to save, an object of hate to the wicked. Up to this time we have heard only songs of joy. The Angel hails Mary as blessed amongst all women; Elizabeth proclaims her Mother of her God. Mary herself in her canticle speaks only of the triumph of God and of the deliverance of Israel. Holy Zacharias recognises the Sun of Justice which rises in the highest heavens, the Angels announce to the shepherds the good tidings of great joy, and the shepherds believe and worship; the star appears, and the magi in their turn come to worship. Simeon blesses God for having shewn him the salvation of Israel. The stable of Bethlehem and the hard hearts which refuse a shelter for the birth of their Saviour, alone remind us that all arms and hearts will not be open to receive Him. But this was not enough: hear how the Gospel goes on. Mary and Joseph are kneeling in the Temple, and Simeon holds in his arms the Infant Jesus. "And Simeon blessed them, and said to Mary His Mother: Behold this Child is set up for the fall and for the resurrection of many in Israel, and for a sign which shall be contradicted: and thine own soul a sword shall pierce, that out of many hearts thoughts may be revealed." He is come to be a sign which shall be contradicted; to be an example of purity and spotless virtue, against which the impurity of the world will rise; to be the voice of infallible truth, the voice of God announcing a more perfect law, against which the hypocrisy of the Pharisees and the doctors will rebel; to be the defender of the lowly and the poor, the comforter of the afflicted, against whom oppressors of every class and sort will take arms. Behold the Man of Sorrows ; behold Him who will be esteemed as a leper, and wounded for our iniquities ; behold Him who comes for the fall or the resurrection of many in Israel, for to the sins of the wicked, ingratitude and impenitence will be added, and the ill for which they refuse to receive a cure will become to them the cause of their eternal death. "Woe to their souls," says the prophet, " for evils are rendered to them. Say to the just man that it is well, for he shall eat the fruit of his doings. Woe to the wicked unto evil, for the reward of his hands shall be given him." (Isa. iii. 9-11.) Yes, this Child whom the aged Simeon blesses, and whom he worships, before giving Him back to His Mother, is He who is about to change the face of the earth. There is no one, from the king on his throne even to the most heartlessly neglected of the poor, whose existence and eternal destiny the coming of this Child does not change. This Light of Israel, which God reveals to the eyes of holy Simeon, is soon about to be shed over all the earth. It will enlighten all things; it will penetrate even into those depths in which falsehood and human pride are hidden. It will make what is good shine out in all its beauty, and it will light up evil in all its deformity. After His coming uncertainty as to good and evil can exist no longer. Man will choose freely, and henceforth sin will no more have the excuse of ignorance. Happy they who fixing their eyes on this divine light, will take it as the guide of all their steps, and will direct them towards it with all their strength, despising the false lights of the earth, which dazzle and pass away like those ignis fatuus lights which we see wandering about on summer nights, and suddenly disappearing in darkness. Happy those who, hailing Jesus in His cradle with good will, as did the shepherds of Bethlehem and the magian kings, will walk courageously in His train, blessing and imitating Him every day of their lives, to the best of their feeble powers, worshipping Him in the sorrowful memorials of His Passion and Death, and drinking in peace and resignation their chalice, so little bitter in comparison with His. Blessed are they, for the Infant Jesus is born to be their hope in this world, and their eternal resurrection in the next. But unhappy, on the contrary, are those who, turning away from the Eternal Light, plunge themselves voluntarily into night, and in their wandering mistake false ignis fatuus lights for the bright beams of day. Unhappy those who, despising the Infant Jesus in His crib, follow Him not in His life nor in His death, for there will be neither excuse nor pardon for them, if they persist in their blindness and impenitence: the Infant Jesus is not come for their resurrection but for their fall. Alas ! the number will be but too great, of these ungrateful men, who will find death where they should have found life. The eternal sign of salvation, the word of God, the mark which Jesus our Saviour places by baptism on the brow of every Christian, Jesus Himself, His holy Church and her divine teaching, will be the sign to be contradicted, will be the object of calumnies and blasphemies, and of the attacks of the wicked. This vineyard of the Lord is our soul! Our soul which He has placed in a Christian country and family, from which He in our youth, by the holy teaching of the Church, has withdrawn all doubts and all the errors of ignorance, just as the householder picked the stones out of his vineyard. Our soul, in which, since then, He has implanted so many good desires, so many holy resolutions, like those choice vines, planted by the hand of the Master of the vineyard. Our soul, in which, in those blessed days of childhood and of first communion, He raised as it were a tower of Faith, gratitude, and courage, in which our firm will was to endeavour to render to the Householder the fruit of so much pains and trouble. Let us pray to God that not one of our souls may be compared to this ungrateful vineyard, which, as the return of so much labour, gave only wild and bitter fruits. Let us think of the terrible chastisement inflicted upon it by Him who had cultivated it with so much tenderness; then let us cast a salutary glance upon ourselves; let us remember that Jesus, our Saviour and our hope, will one day be our Judge, and that the Fatherly Hand so ready to bless us, may through our fault become the avenging hand which will chastise us for all eternity. Let us humble ourselves before God, and let us promise to labour with courage and perseverance in this vineyard of our soul, which He has so much loved; then, after having called on His mercy to compensate for the weakness of our efforts, let us unite our voices with confidence to that of the holy Simeon, to hail the Infant Jesus, the Infant Saviour, and His holy Mother; let us hail Mary and mingle gratitude and sympathy with our reverence, for now for . the first time Mary suffers to obtain for us salvation and life* Holy Simeon said: " And thine own soul a sword shall pierce, that out of many hearts thoughts may be revealed, that a ray of light and justice may come in which the just will gather the fruit of their labour, in which the wicked will see the recesses of their evil conscience made manifest in the broad daylight. Let us rejoice in this expectation, we who can with humble hope call ourselves men of good will. Let us call to our aid her whose mercy will but plead for our weakness, her whose voice has the most right to make itself heard. Henceforth she participates in the work of our redemption, no longer by her acceptance of the Divine Maternity alone, but by that grief which beforehand pierces her soul like a sword: for according to a pious belief, immediately after the words of holy Simeon, a veil was lifted, as it were, from Mary's eyes : she saw open before her the long perspective of her Son's sorrows, weariness, and suffering; a sorrowful perspective, ending at Calvary and on the Cross. 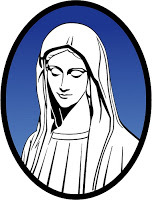 Henceforth no happiness without tears; worthy Mother of the Man of Sorrows, she will be called the Mother of Sorrows. 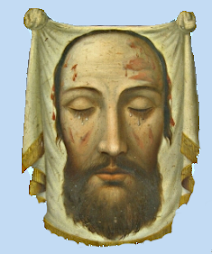 Henceforth, when her Infant smiles upon her, when He grows under her eyes in grace and beauty, the hidden wound will bleed, and she will long to recall the hours and to lengthen the days which bring her beloved Son nearer to the agony of Calvary. Mothers should understand the sorrows of Mary, and love her much, for she has suffered much for us. Kneeling in the court of the temple, she heard the last words of holy Simeon, and the first drops of the bitter chalice fell on her heart. In the meantime, a voice sounds again on her ear, a friendly voice, which she had doubtless more than once heard in her childhood, and which thrilled through her as it joyously blessed the Saviour. " And there was," says the Gospel, "one Anna, a prophetess, the daughter of Phanuel, of the tribe of Aser ; she was far advanced in years, and had lived with her husband seven years from her virginity. And she was a widow until fourscore and four years, who departed not from the temple, by fastings and prayers, serving night and day. Now she at the same hour coming in, confessed to the Lord, and spoke of Him to all that looked for the redemption of Israel." Let us leave this scene of joy and sorrow with our hearts filled with gratitude. Not without cause does the Church celebrate this day as one of the most beautiful feasts of the Blessed Virgin. It is the day on which begins her share in the work of our redemption, on which, for the love of us poor sinners, she accepts the sorrows from which our salvation will come. In past times our fathers flocked in crowds to Mary's sanctuaries, and thousands of lights burning either on the altars, or in the hands of the faithful, recalled the coming of that Light of Israel, so impatiently awaited, and hailed with so much joy by Simeon and by Anna the prophetess, this feast loved by all faithful hearts, and placed as a benediction at the beginning of the year, we still know and love, and still call it by its ancient name of Candlemas-day. We come, as in former days, bearing in our hands the candle of yellow wax, the produce of our bees, and on that day the housewife is up before dawn, to deck her garden hives in holyday attire, and to awaken them according to the old custom. Labour well for God and me." Mary, mother of sorrow and of hope, teach us the divine secret of thy joys and thy sorrows; show us that in thy life they join and mingle with one another like the links of a mysterious chain. Teach us that from sorrows well borne spring lasting joys, whilst from passing joys too eagerly sought after spring lasting sorrows. O Blessed Virgin Mary, obtain by thy prayers that thy Divine Son may have come for our eternal salvation, and not for our fall. Obtain that nothing in our life may contradict Jesus the Eternal Word, in whom we desire to believe, or the cross with which our brow was signed in baptism, and with which, by His grace, it will again be signed in the hour of death. " O thou who art at once the Mother of God and the mother of the sinner, the mother of the Judge and the mother of the exile: since thou art the mother of these two sons, permit not thy guilty child to be condemned by thy Child, who is God." (Prayer of St. Ignatius.) Amen. To accept all suffering for the love of God, and after the example of Mary, who accepted all her sufferings for us.